Digital Home Service is an E-service company in the cities of Hyderabad & Secunderabad. 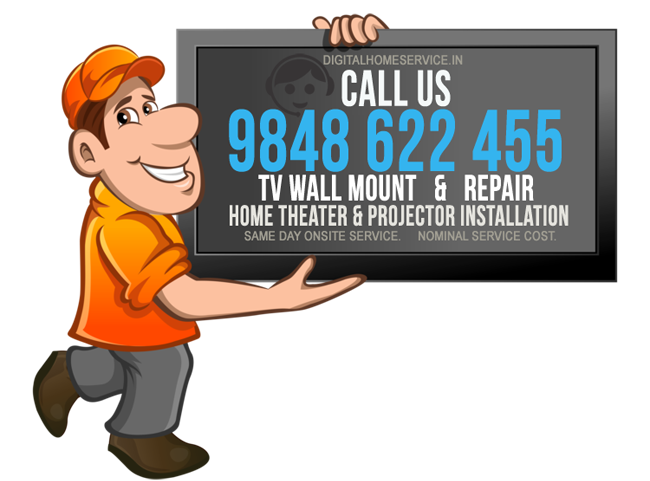 We are into the services of TV Wall mounting (LCD, LED, Plasma), LED TV repair SERVICE, Home Theater installation/repairs, Projector installation, CCTV installation and DVD repairs. We handle online orders/complaints of the above mentioned services and serve you as quickly as possible. We handle service orders on-call or can book our service appointment by filling out form on the right sidebar. Since 20 years we are into this field and has specialized in our services. We handle online orders for the aforementioned services for Residence/Office/Corporate buildings and serve you as quickly as possible. Owner of ANJANA SRI ELECTRONICS Mr. Karunakar here introduces as follows, Karunakar: I’m pleased to introduce myself to you as i’m the owner of Anjana Sri Electronics here by named Digital Home Service. Now with 20 years of experience into services of installations and repairs of Television, Home Theater, Projector, CCTV we became top service providers. For any of our aforementioned service you can always count on us to be there for you as quickly as possible.